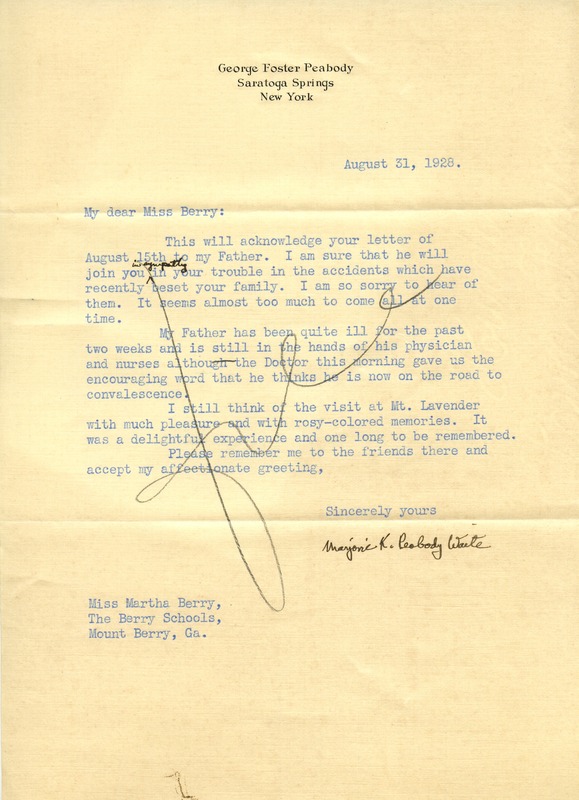 Waite acknowledges Berry's letter to her sick father and the accidents that have beset Miss Berry's family and she expresses her sympathy. Marjorie K. Peabody Waite, “Letter to Martha Berry from Marjorie K. Peabody Waite.” Martha Berry Digital Archive. Eds. Schlitz, Stephanie A., Olivia Mund, Sherre Harrington, Chelsea Risley, Alan Henderson, et al. Mount Berry: Berry College, 2012. accessed April 26, 2019, https://mbda.berry.edu/items/show/8645.